Genuine leather taken from deer. Fine in structure and very soft. Sourced from the Horween tannery in Chicago. Luxury equine leather. Subtle shine, high durability. Requires intensive processing. Tear-resistant leather taken from crocodiles. CITES-certified. Extremely decorative reptilian leather taken from alligators. Exotic leather taken from giant snakes. CITES-certified. Robust, long-lasting and decorative. Fish leather sourced from Asia. Easy to care for. Thin, pointed forefoot area with fine rising sides. Leather with a special grained, woven or exotic surface. Welcome to the fascinating world of exotic men’s shoes. 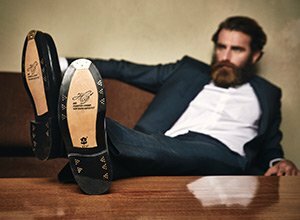 Whether python, alligator, ostrich, ray or crocodile, these shoes offer a high degree of ornament without resort to Brogueing. Genuine exotic leather is a real head-turner in its own right. Although it is possible to make leather from virtually any animal skin, only a few are suited for the production of shoe uppers. The particular characteristics and availability of a given leather decide its suitability for shoe production. The majority of men’s shoes are crafted from finest box calfskin, actually an off-shoot of the meat industry. The origin of shoes made from exotic leather types is different from classic box calf leather though. Exotic leather skins come from specially farmed animals whose hides are then tanned. The tanning of exotic leather skin though is much more difficult than normal calfskin, which explains the higher cost of such decorative leather. All of our leather skins are bought from specialist factories and fulfil the Washington Convention on International Trade in Endangered Species of Wild Fauna and Flora. The alligator skin we use is also CITES-certified. It is important to remember that however beautiful a shoe crafted from an exotic skin maybe is, the shoe industry must not be allowed to harm the planet’s biodiversity. We support responsible industry practices to guarantee the beauty of extraordinary shoes made from exotic leather in the future. All of our shoes are Goodyear-welted and handmade. The exotic leather is slow vegetable tanned, which gives the shoe durability and shine with little maintenance. They are simply unique. Added to the painstaking craftsmanship of our exotic shoe collection, we use the best leather sole in the world, the John Rendenbach Jr. sole, tanned for a year in oak leaves, which makes it extremely long-lasting and exceptionally comfortable.